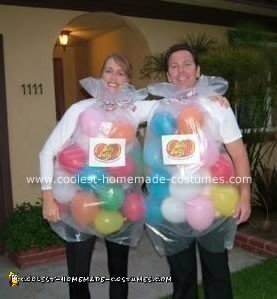 For the bag of the Homemade Jelly Belly Halloween Costume, I used a large, clear trash bag. I cut holes in the bottoms of the bags for our legs. Inside are obviously just balloons of different colors. I tied the bag around the neck with colorful ribbon and printed out a label from the Jelly Belly website and taped it on. I might suggest just having the bag stop at your waist instead of cutting holes in the bottom for both legs. It was mighty time-consuming for restroom visits. It was very inexpensive. I won the costume contest at work with this one. This is the best costume idea ever! I will definitely try it out this Halloween! Thanks! I am a student with little time or money to spend this year, but this is def super awesome! Stress of a costume idea gone! thanks a bunch!! how do you ride in the car? I am thinking about using this idea this year, but our group always goes out all night. any suggestions? wow! this costume is way too cool… I’m totally going to do this! it’s also perfect for trick or treating since you don’t have to worry about getting cold or it’s raining. so awesome! how did you go to the bathroom?? this is a great! How on earth did you come up with it? I’m sure to use this one on Halloween. Thanks for submitting the idea! How long does it take to take on or off? wonderful job thats what im going to be for halloween thanks! My daughter is 10, and this year is the first year that she really wasn’t sure what she wanted to be. We’ve never done homemade costumes because I’m not creative and crafty. She finally decided what she wanted. I bought her a costume that was on sale, it didn’t work out. I am up at 1:30am trying to see if I can pull something off at the last minute. She has a school parade later, and she wasn’t too thrilled about what we decided on before she went to bed. I came across this, and I am sure she will love it! Plus, it’s quick, easy and cheap. I can put it together while she’s at school and take it to her before the parade! THANKS! This is what i’m doing and it looks TOTALLY AWESOME! I can’t wait till i’m done! I’m going to try not to drink at all! Thanks for the idea. Tip- use 7 inch balloons, they look more like jelly beans! This is too cute! Right up my alley..cheap, easy and it is probably gonna be raining so its also helpful!! Thanks for sharing! Last night was halloween and I got sooooo many compliments! We had a little trouble with making it though. We ended up taking the bottom of the bag and put duct tape all around on it so that I could wear it like a shirt and so the balloons wouldn’t fall out from the bottom. We also used duct tape at the neck because the bag kept escaping from under the ribbon, so we put duct tape and put a ribbon over it. I had so much fun wearing this costume! I recommend this to everyone!!! I was the only one wearing this costume thats for sure! One thing though, it was pretty cold last night yet I was still hot in this costume. So keep that in mind. Thanks for your comments, everyone. It was tough to use the restroom in it, so that’s why I thought securing it around your waste would be easier then putting your legs through holes in the bottom of the bag like we did. For car rides, I just stepped out of the costume and then stepped back in and tied it at the neck. Thank you so much for the great and most SIMPLE idea in the whole world!! I have a costume contest in my school and I didn’t know what on earth to be this year. And when me & my mom found this we knew that THIS WAS THE ONE!!!! And I know I AM going to win!!! I made a similar costume in 2008 and wore it to work. I used two trash bags and taped them together at the sides; one bag was the front of the costume and one was the back. I wore them like a tube (think bubble dress) with the balloons in each bag. I also enlarged and printed the nutritional values statement out and taped it on the back. It was an easy on and off costume! I agree that this costume is great for work because it is inexpensive, light weight, imaginative, inoffensive and fun! I used this great idea on my whole family!I recommend highly! This looks fantastic! Reminds me of the time I went as a bunch of grapes to a costume party – by the time the end of the evening came I was just some chick in a green body suit with limp bits of rubber hanging off her LOL!!! My hard to please eleven year couldn’t make up his mind again this year for a Halloween Costume. When I showed him your picture, he smiled and said, “That’s it Mom!” so thank you so much for the awesome idea, instructions and cute picture! It’s a wonderful costume!!! love it that’s what im being for Halloween. This is what my daughter has decided to be. Thank you for posting this idea. It is very cute, very fun. And it will be easy to put together. This is just the best idea ever; but, I’m perplexed. My trash bags are either black or white; where do I find clear? it seems everyone knows but me! what size trash bag for an adult, please? this is the coolest costume ever!!!! thanks soo much!! anyone know were to get clear trashbags???? never seen them :P i htought id be a pair of pants with my frilends (each in a leg) but this is so much better!!!!! thnx so mmuch!!! omg, thanks so much for this post! i am so being this for Halloween with my friend this year(2010) we will for sure win some contests thanks so much what a great costume idea! I couldn’t find any large clear trash bags at any of the grocery stores I tried, but I did get one from cabin service on an airplane. They seem to be used by large industries when they change their trash. Maybe ask the help at a restaurant or grocery store if you aren’t flying anywhere between now and Halloween. Can’t wait to try out this costume! I found the large clear bags at wal-mart…it is a big roll and it is a little pricy but you will get a lot of use out of them with other projects and household needs. And they are durable too! I went to my local party store (Party City) and went to the ballong department and asked for the ballon bags (the are the large clear bags that they place multiple balloons in) They did charge me $1 each, but it was worth it. We cut the bottom off the bag and then retaped with clear packing tape to resemble the end of a sealed bag. Then I took little pieces of the packing tape and put one piece on each ballon and stuck it to the bag where we wanted them, then I turned the bag inside out (this was a little tough to do and did pop a couple ballons in the process. then I had my daughter put on. Then we removed one of the ballons and cut a hole for her face (which we will use white facepaint for and she is going to wear a colored thick headband as well, this way her face looks like one of the jelly beans too). Then we cut the arm holes. the ballons wont fall out the bottom because they are taped to the bag. this way she wears it like a dress and it is easy to take off. How many balloons did u buy to put in the trash bag? i have no idea on what i wanna be but i now know EXACTLY what i am going to be!!!!! I loved this costume and I’m going to be it for Halloween. I’m not allowed to buy a costume, and I was totally desperate for some ideas. When I saw this, I knew it would be perfect. Wish me luck that it turns out okay, and thank you so much for your idea! OMG THIS IS THE BEST COSTUME EVER, TOTAL GENIUS!!!! ALL THE GIRLS WILL LOVE THIS ONE. Thanks for sharing your idea. I made the costume for my office contest today and also won. I took your suggestion and just made a front and a back following your instructions and then tied the two bags full of balloons together with ribbon at the ankles and the shoulders. It allowed me to slip it on and off. To make it funny, I also wrote out the nutritional value and glued it on the back section. Nothing like waiting until the end to decide what to go as for Halloween. Awesome job! many years ago…in 1985 i made myself to be a bag of jelly beans as my statement against our war in Grenada and the Reagan administration…I took interfacing and made the bag with snap crotch and drawstring top and for the “jelly beans” i took the small water balloons and blew them up. I drew a monkey for what i thought the war to be on our American backs and wore a cowboy hat and boots to represent Reagan. I am glad that somebody won money for this idea because the Americans have lost so much for the original idea i had. balloon drop bags work great! you can find them at any party supply store for about $7. Much easier than searching everywhere for large clear plastic trash bags. That is such a great idea!! Me and my friend are going to be that for Halloween!! how todo put the platic bag on ? It was sooo easy to make and very cheap!!! I won the costume contest at work. Tonight was trick-or-treat, and my son has never had so many compliments on a costume before! People said how much they loved the jelly-belly costume, and he came home with more candy than I’ve ever seen. Neighbors gave him the KING size bars, etc. while his friends got the snack size bars. I would recommend this costume to anyone who is looking for something different! Saved so much money too!! Thanks Lori-Ann for the great costume idea!!! This is awesome im def doin it!! Great idea but I will tie it at the waist instead of doin leg holes!! Tht would be hard to go if u know what i mean!! If you cant find clear trash bags try a company they seem to use them alot. OMG im SO being this for HALLOWEEN! THANKS for the awesome IDEA! EVERYONE~ you can buy CLEAR TRASH BAGS @ HOME DEPOT. their super big too! sooo cool! im going trick or treatn for key club for unicef! and i had no clue what to do! not any more! i love it! thank you! thank you! thank you! OMG.. i love this idea, and im sorry i have to take it. it was last min but i love it!!!!! you amazing!!! I used drop cloths and red duct tape to hold the sides together! Can’t wait to try it out tonight!! Thanks for this great idea, and the suggestions from other people helped! I bought a balloon pump at the party store, and it was worth the $5. The balloon drop bag it worked well. I placed plastic shipping tape in the middle on both sides after filling the bag with balloons. I cut a slit on the tape, and taped around the slit. I wore it like a poncho. I used the cord that came with the drop bag, and looped it in the bag to tie around my waist. I printed the Jelly Belly logo and taped it on the front, and the nutrition info taped on the back. Other then my fingers getting sore from tying balloons, it was easy. Thank you sooo much for sharing this costume idea! The other comments with tips helped as well. I used drop clothes to make two bags and I glued the two bags together using a hot glue gun. I made a dress with the two bags. Easy to slip in and out of and easy access for going to the bathroom. I’m super excited and I can’t wait to see the look on my co-workers faces! Thanks! It worked great, but I think i made balloons a bit big! how did u do the arms? I have looked all over and can’t find a large enough trash bag! Where can I find one? its urgent! Holloween is tomorrow!!! Me and my two friends are planning on doing a group costume so we looked everywhere. I looked on Pinterest and couldn’t find anything until I came across this. The only problem is we don’t know where to get clear trash bags. Overall this is a great costume and we wouldn’t have a costume if it weren’t for for you. Thanks! A question… Where can we get transparent trash bags?